With the new Fujinon GF 110mm f/2 R LM WR, Fujifilm has crafted a medium telephoto prime lens well-suited for portrait photographers in particular, thanks to its 87mm-equivalent focal length and bright f/2 maximum aperture. Coupled with the medium format sensor of the Fujifilm GFX 50S, the f/2 aperture creates a very shallow depth of field with a heavily blurred out of focus regions. The speed does not come cheap, however, as the Fujinon GF 110mm f/2 retails just shy of $3,000, which is a lot to pay for an 87mm-equivalent prime lens. Does the performance justify the cost? Let's find out. The GF 110mm f/2 features the same great build quality I've come to expect from Fujinon lenses, particularly GF lenses. The lens has a black metal barrel and is fairly large. You can see how it compares in size to the GF 23mm f/4 and GF 32-64mm f/4 lenses below. In absolute terms, the lens is 4.94 inches long (125.5 millimeters) and its maximum diameter is 3.71 inches (94.3 millimeters), although as you can see it is narrower closer to the camera body itself. The lens takes a 77mm filter. The lens hood, which is about 3.5 inches long (90 millimeters), makes the lens much longer when in use. With the lens hood attached, the GFX and 110mm f/2 combination is quite large but also well-balanced. The lens feels great on the GFX. With that said, it is nonetheless heavy, weighing 2.23 pounds (1,010 grams) by itself. As is disclosed in the full product name, GF 110mm f2 R LM WR, the GF 110mm is weather resistant. In fact, it is weather, dust and freeze resistant. It's a rugged, heavy-duty lens up for the challenges of a professional workflow. As a Fuji prime lens, there are only two rings to think about, the focus ring and the aperture ring. The focus ring is just under two inches wide (around 50 millimeters), which is plenty of surface area for a good grip. The focus ring rotates smoothly and offers a good amount of resistance. The 110mm lens is fairly easy to manually focus and is well-suited for small, precise adjustments, although some of its performance depends upon your camera settings as it is a focus-by-wire lens. If you are looking for the ability to make fast changes in focus across a large distance, the GF 110mm is not as easy to use manually. Even a fast rotation doesn't result in a considerable change in focus distance. I think this is fine and a better way for the lens to manually focus. It's better to have a longer throw distance so that it's easier to make minute adjustments. The aperture ring has a nice ridged surface, and the full stop apertures are engraved on the barrel. I would prefer a bit more resistance when rotating the aperture ring, as there were times I accidentally rotated it a third of a stop. You can also set the aperture to its locked "C" or "A" position to have it user controlled or selected by the camera body itself, respectively. Overall, the GF 110mm f/2 feels good and has good build quality. The lens hood, while quite long, looks to be of high-quality and rotates onto the end of the lens securely, plus it has a locking mechanism. The focus and aperture rings both perform well. While not a compact, lightweight lens, I have no complaints about the 110mm f/2's build. With its 14 elements across 9 groups, including 4 extra low dispersion (ED) elements, the GF 110mm f/2 R LM WR delivers excellent sharpness. The lens is very sharp in the center and maintains great sharpness across the entire medium format frame. 100% corner crop of JPEG image. Click for original image. Click here for the RAW file. As we can see above, even when wide open, the Fujinon 110mm f/2 lens is sharp. With that said, stopping down from f/2 to f/2.8 leads to a noticeable increase in sharpness. After f/2.8, however, there aren't obvious gains to be seen in terms of sharpness within the context of real-world shooting. Beyond f/2.8, any gains in sharpness are minimal and not going to be noticed in a real-world shooting situation. I had to pixel peep to an excessive degree to see any difference. You are free to do so in the gallery as well. However, diffraction is noticeable, which starts to set in beyond f/5.6. 100% center crop of RAW image. Click for original image. Click here for the RAW file. Ultimately, sharpness is but one quality of a lens, but if you're using a GFX 50S, you are certainly a user that cares a lot about sharpness and resolution. The GF 110mm f/2 is absolutely a lens which can bring out the very best the sensor has to offer. In fact, I think it's safe to say that the lens is out-resolving the sensor by a considerable margin, which is no surprise given Fujifilm's promise that all of their GF lenses are being designed for 100-megapixel sensors. The GF 110mm generally handles chromatic aberration very well, especially for a fast prime lens. The lens displays some blue/yellow chromatic aberration in high-contrast situations, although in my time with the lens, it was never a problem. It's a common issue for a lens like this and the GF 110mm cannot avoid it entirely, however, it does perform quite well. Chromatic aberration samples. 100% crops from RAW images with only built-in lens corrections applied. From left to right, apertures f/2.0, f/2.8 and f/4. Click for the original images: f/2.0 (RAW), f/2.8 (RAW) and f/4.0 (RAW). Let's take a closer look at the image captured at f/2 to see if the situation is worse than the 25% crop above shows. In the 100% crop below, we can see that the file does show some chromatic aberration, but really not very much. Good results here for the GF 110mm f/2. Normally I would need to show a variety of images at different apertures to illustrate how much less vignetting there is as you stop down, but that really isn't necessary with the GF 110mm f/2 R LM WR because it displays such little falloff even when shooting wide open. Sure, there is some and it improves as you stop down to f/2.8 and a bit more beyond that, but for all intents and purposes, the GF 110mm f/2 does not have problematic vignetting. In real-world shooting, you'd be hard-pressed to notice it at all. High marks for the 110mm f/2 here. The Fujinon GF 110mm f/2 has very nice bokeh performance thanks in part to its rounded aperture, which as we'll see below really is round. The out of focus areas, especially wide open, are very smooth and pleasing. There is subjectivity to that, of course, but it's those subjective elements of a lens that make people love certain glass; that particular look from a lens is what makes it special. For me, the GF 110mm f/2 offers great bokeh because highlights are mostly round and darker areas are rendered in a very smooth, consistent way. There is a nice transition from in-focus to out-of-focus that is smooth, essentially color-neutral and lends a very nice depth to images. 25% crop from the center. Bokeh test image. Click for original image. Click here for the RAW file. Even when stopping the lens down, bokeh remains smooth. At f/2.8 through f/4, where the lens is particularly sharp and displays minimal chromatic aberrations, the out of focus area is still buttery smooth. In fact, I somewhat prefer the look at f/2.8 because out-of-focus highlights near the corners stay very round. At f/2, as you can see below, you get some "cats eye" effect only in the extreme corners, which is good performance, especially considering the sensor size. Basically, bokeh doesn't get a flat-top look until you get quite near the corners and that effect is diminished as you stop down -- even at f/2.8 it is dramatically diminished. Considering the medium format sensor, to have a mostly unobstructed perspective on the out of focus area near the edge through the GF 110mm f/2 is an impressive feat of engineering. Bokeh test image. Click for original image. Click here for the left RAW file. Click here for the right RAW file. Bokeh samples. From left to right, apertures f/2.0, f/2.8 and f/4. As you can see in the comparison shot above, bokeh remains very round even when you stop the lens down and also stays more round near the corners as you stop down. There is still a slight flattening of the out-of-focus highlights, but it's not dramatic whatsoever and I wouldn't consider it even a slight distraction. Let's look closer at the bokeh. In a 50 percent crop of an image shot at f/2 -- in fact it's the f/2 image from the first comparison in this section -- we can see that there is very minimal "ringing" as you move from the center of an out-of-focus area to the edge. It's not quite the same transition you'd see with an apodized lens, but it is pretty impressive. 50% crop from the center. Bokeh test image. Click for original image. Click here for the RAW file. Overall, I would score the out-of-focus performance of the GF 110mm f/2 R LM WR lens very highly. Fujifilm has clearly put a lot of emphasis on creating nice bokeh. The Fujinon GF 110mm f/2 lens utilizes a linear motor for its autofocus. The lens is an inner focusing lens, meaning that the physical length of the barrel does not change throughout the focus range, unlike the GF 63mm f/2.8 lens. Autofocus is pretty quick across much of the focal distance range, although the lens is noticeably slower and more prone to hunting near its close focus distance -- which is 2.95 feet (0.9 meters), resulting in a maximum magnification of 0.16x (1:6.25). You can see what that close focus distance amounts to in the test shot below. Close focus test image. The GF 110mm does not have a very short close focus distance. If you need a medium telephoto lens with good macro performance, the macro-capable GF 120mm f/4 is a much better choice. Click for original image. Click here for the RAW file. Focus accuracy is not an issue for the GF 110mm f/2. However, especially when shooting at or near f/2, the depth of field is very narrow so any user error or subject movement is magnified. Moving the camera ever so slightly between focus acquisition and image capture can be the difference between a sharp shot and a soft one, especially when working near the close focus distance. In low light, the GFX itself is the limiting factor because the GF 110mm f/2 seemed to be more capable than the other GF lenses I've used (all except for the 120mm macro lens). An aspect of the GF 110mm that I don't particularly like is that it is quite loud when focusing. It's not as loud as the GF 63mm, but it's much louder than the GF 32-64mm and GF 23mm lenses. Not only is the lens quite audible, it makes an odd sound unlike anything I've heard from a lens before -- sort of a high-pitched sound, like a warbling sound. It happens whenever you go from playback to shooting or wake the camera up from sleep mode. It's not a big issue and I got used to it quickly, but it is a little jarring at first. Overall, the GF 110mm focuses well. It is smooth, moderately quick and accurate. It would be nice if the close focus distance was shorter and the lens was quieter during operation, but I don't have any autofocus complaints. As I mentioned, the very shallow depth of field and occasionally sluggish autofocus can be problematic during portraiture. With a model who is moving slightly, and while handholding the camera, the lens is not always quick enough to keep up with the movement. Although, part of the issue is that the GFX's continuous autofocus performance is only fair. 100% crop of the unedited JPEG file of the above image. Click for original image. Click here for the RAW file. With such a small margin for error at wide apertures, especially f/2, there will be shots that are slightly out of focus. I don't think that the lens deserves much blame, but it remains important to note that the lens and camera combination is very demanding and any slight error in focus or in technique will be magnified considerably. You don't have the room for error that you might have with a narrower aperture lens and a smaller sensor. The high level of required precision pays off greatly when everything comes together. The lens delivers incredible detail and excellent transitions from in-focus to out-of-focus, both in front and behind your subject. Paired with the GFX 50S, there is a lot of depth in images captured with the GF 110mm f/2 R LM WR lens. While out of focus rendition is, as I've discussed, a subjective measure, it is this reviewer's opinion that the GF 110mm is a dynamite portrait lens thanks in large part to its bokeh performance. Hot air balloons & sunflowers: How does the GF 110mm handle as a walk around lens? I took the GFX and GF 110mm (and GF 23mm f/4) to a hot air balloon festival in Presque Isle, Maine. I arrived just before sunrise and started taking some documentary shots of the balloon pilots as they set up and inflated their balloons. In the low light, the GF 110mm was somewhat slow, but it was very accurate with its focus. The f/2 maximum aperture helped me capture some nice shots even though there was not a lot of light. This is the fastest GF lens yet and it's noticeably better in lower light than the other GF lenses I've used, even the GF 63mm f/2.8. Once the sun had gotten higher and the balloons were inflated and ready to go, the GF 110mm provided a nice angle of view and some very nice handling. It is a pretty heavy lens, but it was no issue aiming it up overhead and panning with the balloons. After a successful shoot with the GF 110mm, I headed back home. On the way to the festival, I didn't notice a huge field of sunflowers because it was still dark, but on the way home, the massive yellow field jumped right out at me and I stopped to take shots with both the GF 110mm and GF 23mm lenses. The GF 110mm did very well in this situation, capturing sharp images while providing nice subject isolation and excellent performance across the entire frame. The Fujifilm GF 110mm f/2 R LM WR is a fantastic lens to use with the Fuji GFX 50S and will certainly pair well with whatever camera is next in the GFX system, even if it features more megapixels than the GFX 50S. The 110mm f/2 is an incredibly sharp lens across the frame, even when used wide open. It offers other very nice optical qualities as well, including very nice bokeh and images that display a tangible level of depth. With that said, no lens is perfect. The GF 110mm f/2 can be somewhat slow at focusing, although as I discussed, the blame for that may well be placed squarely on the GFX 50S and its contrast-detect AF system. Also, the lens' close focus distance can be somewhat limiting in certain portraiture situations. And while not perfect, the GF 110mm is absolutely a stunner of a lens and an optic every portrait shooter with a GFX 50S must consider adding to their arsenal. 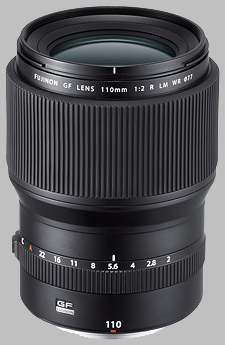 The Fujinon GF 110mm f/2 R LM WR doesn't have any user reviews yet!